Lasers are a vital research component in any number of branches of physics. From quantum physics’ quest to better understand and utilize entanglement to the creation of Bose-Einstein Condensate, from spectroscopy to laser cooling, the applications for lasers in physics are legion and ever growing. If you are doing physics research in most any field you will likely have an experimental application for lasers, but in no field is this truer than in atomic physics. Atomic physicists rely on the precise measurements attainable by the various laser spectroscopy techniques to advance humanity’s knowledge of atomic structure and electron properties. Whether through Raman spectroscopy, Laser Induced Breakdown Spectroscopy (LIBS), or tunable laser spectroscopy, lasers are a powerful tool for plumbing the mysteries of atomic structures. While it seems obvious how important laser spectroscopy is to research universities, it isn’t immediately apparent why this should matter to an undergraduate program in physics at an educational university. It isn’t apparent until you consider how important a solid grounding in research protocols and a foundation in experimental procedures are to someone entering a career in the sciences. This is doubly true for future physicists. A firm understanding of how to do research, of how to design and perform valuable experiments, is absolutely vital to a career in physics. This is why it is so important for undergraduate programs in physics to offer as wide a variety and as realistic a selection of research opportunities as possible; to better prepare students for the real world of the physics researcher. The availability of laser spectroscopy to undergraduate physics students opens whole vistas of valuable experience to them. Photodigm is the world’s leading producer of single frequency semiconductor lasers, including devices certified for atomic transitions of potassium, cesium, and rubidium. We specialize in Distributed Bragg Reflector (DBR) technology, and we use single growth epi as well as passive gratings to provide outstanding reliability, stability, and power. We are becoming the industry standard for lasers used in physics’ most demanding metrology, analysis and spectroscopy applications. 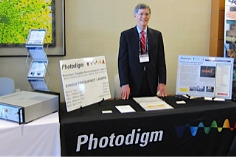 Photodigm exhibited at the recent DAMOP conference, where we met a number of active atomic physics researchers and students. We also met a number of enthusiastic young university physics students at the beginning of their careers. We are proud that so many of these participants find our equipment valuable in performing their research. Whether your institution focuses primarily on research or on education, one of the hallmarks of a good undergraduate physics program is extensive research opportunities. Performing proper research requires access to proper equipment. If your undergraduate physics program includes atomic physics, that means making sure your undergraduate lab has the ability to perform laser spectroscopy. A number of website show advanced physics laboratory experiments demonstrating saturated absorption spectroscopy of rubidium. Photodigm has a limited number of DBR lasers available for educational use. They are certified for the Rb D2 transition (780.24 nm) in a standard (SOT9) package ideal for use in the undergraduate physics laboratory. Contact Photodigm sales for special educational pricing on these devices.